Las Palmas is a beautiful home featuring four bedrooms and four and a half bathrooms. The home offers plenty of room and can comfortably accommodation up to 12 guests. It is one of our featured Puerto Peñasco vacation rentals. The master suite offers a king bed and a full bathroom. The second and third bedrooms also offer king beds and full bathrooms. The fourth bedroom also has a full bath and features two twin beds. The kitchen is fully equipped, letting you prepare and cook up those favorites. There’s a lovely eat-in bar within the kitchen where you can grab a quick bite, or just enjoy some conversation during meal preparations. The condominium also has a separate second smaller kitchen for your convenience. There’s a dining area that features a dining table that will comfortably seat six. In the living room, you will find comfortable furnishings, making it a great place to relax and enjoy some conversation. The living room also features a queen sofa sleeper for extra sleeping accommodations. There’s also a TV with a VCR to enjoy your favorite programs. Outside, you can enjoy some beautiful patio areas with seating where you can take advantage of the stunning ocean views. This area is a wonderful place to just relax, or enjoy some quiet time reading a book or just taking in the ocean breezes and the warmth of the sun. The home complex is located right on the beach, so you will be just a few steps from the sandy shores where you can enjoy the waves. There’s even a beach shower where you can easily shower off the sand from your day’s adventures. 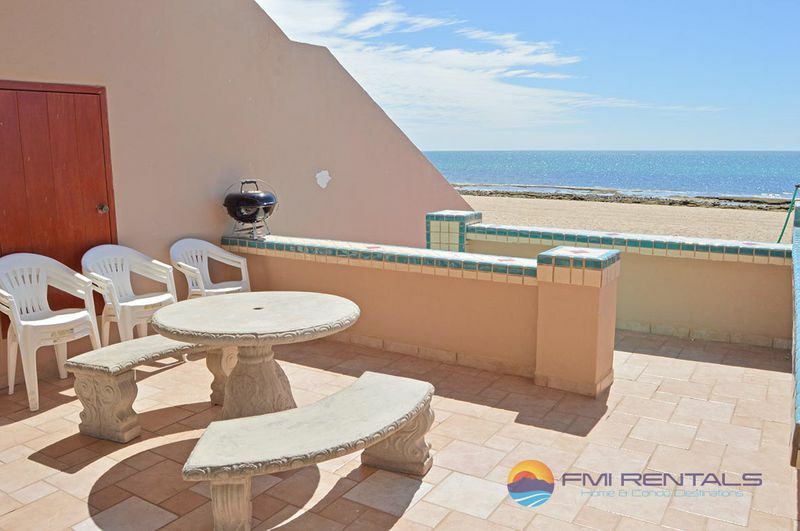 This wonderful choice of vacation rentals in Puerto Peñasco is close to many of Rocky Point’s great attractions and activities. For the fishing enthusiasts you can fish from shore or take a fishing charter. Go out on the water for a lovely dinner cruise, or enjoy the flavors offered by any of the great restaurants and eateries. For those looking for some rest and relaxation, visit one of the soothing spas for a day of pampering. With Puerto Peñasco vacation homes such as Las Palmas, you will enjoy far more living space than a regular hotel stay. You’ll have more privacy with the multiple bedrooms, and the kitchen space will let you save money by preparing your own meals. You can also enjoy trying out local favorites created using delicious local ingredients. Reserve Las Palmas today to ensure that your stay in Rocky Point is truly spectacular!